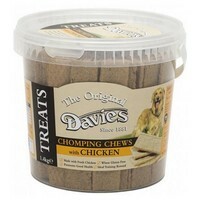 Davies Chomping Chews Chicken are delicious semi-moist treats that are made with 50% fresh meat. They are perfect occasional rewards for your pet and can be used as training aids; your dog will love the delectable chicken flavour! Great product in great packaging. I take one of the chews with me whilst walking my dog, break off little pieces now and then whilst reaffirming recall, he absolutely loves the chews - runs back (almost!) immediately. The packaging is great too as it's very tidy and keeps the treats neatly packed together and fresher than if it were just, say, a bag.